When Bertram (Bert) Skipp retired from working on the buses, he had completed nearly 39 years with public transport, 37 years as an inspector. He was presented with a wrist-watch by Inspector P. Cotterall. This was from fellow inspectors and office staff at London Transport’s Hertford garage. Mr. Skipp was born in New Road, Ware. He joined the Hertford & District Motor Services Co. in 1921, a few months after the firm started the first bus service in the district. 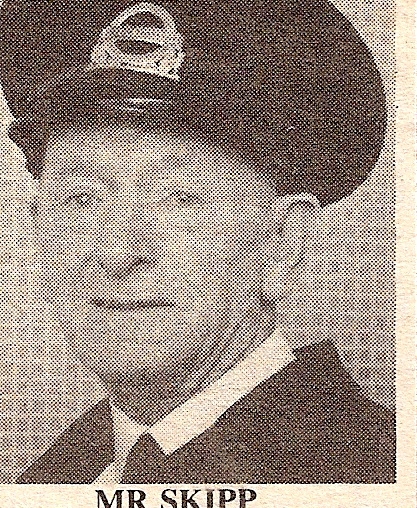 He was initially employed as a conductor but in 1923 he was promoted to inspector. A year later the firm was taken over by the National Omnibus and Transport Co., which was merged with London Transport in 1933. 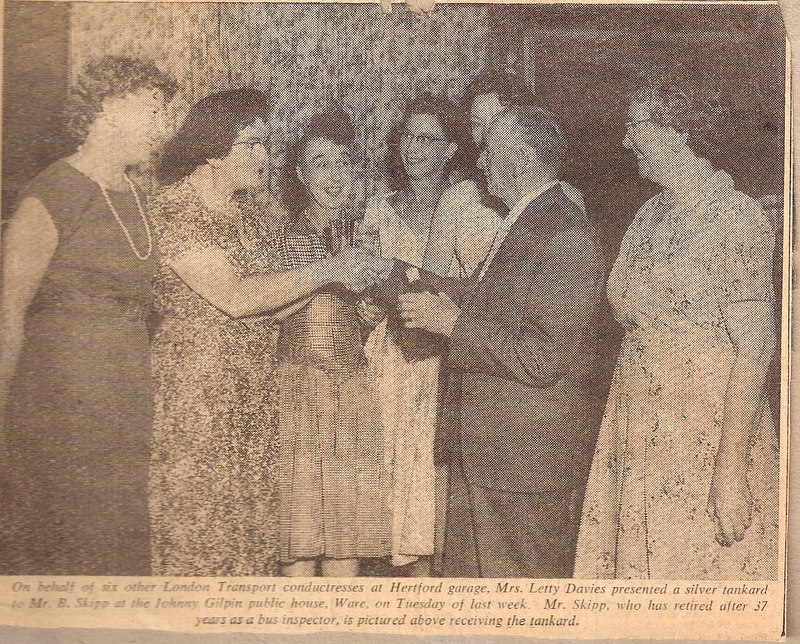 The second photograph shows Mr. Skipp being presented with a silver tankard by Mrs. Letty Davies on behalf of six other conductresses who had worked with him since 1940. They called themselves “Skippy’s Clippies.” The tankard was inscribed, “Happy Days with Skippy.” The presentation took place in the John Gilpin public house, Ware which was Mr Skipp’s local. Mr. Skipp married his wife Daisy, who came from Wadesmill, in 1916 at Christ Church, Ware, before he was posted to France to serve with the Herts and Beds Regiment in the First World War.